Information on Land Patents are available! Please contact us for a Land Patent Booklet! CLICK HERE TO PAY FOR YOUR LEGAL NOTICE INSTANTLY USING PAY-PAL! Your Land was originally acquired within the United States of America by a treaty. Your Land Patent secures the rights of the Treaty upon which the land was originally acquired within the territories of the United States from the Treaty to the individual person named on the patent. The patent specifically grants the described lands to the party named on the patent and to their heirs and their assigns forever. The party named on the patent then passes the inheritance, grants, or assigns the patented lands to someone else, which heir or assignee is now named on the patent by that assignment. The documents that demonstrate such an assignment are often called, "Deeds". Because the granter can not compel you to accept the assignment it is necessary for you to take some action to signify your acceptance of the assignment. For this reason we use "Declaration of Land Patent". Once you have accepted the proper assignment of the Land Patent with proper documentation, your land patent will "heir and assigns forever". After your land patent has ran for four consecutive weeks you will receive: four certified affidavits stating it was ran in the newspaper for four weeks with no claims, A Notarized copy of the official Land Patent from the Bureau of Land Management, A declaration of Land Patent (this is what you will submit to your register of deeds) and the four issues of the newspaper in which it was ran. A Copyright works the same way. However, we do not draft them for you. 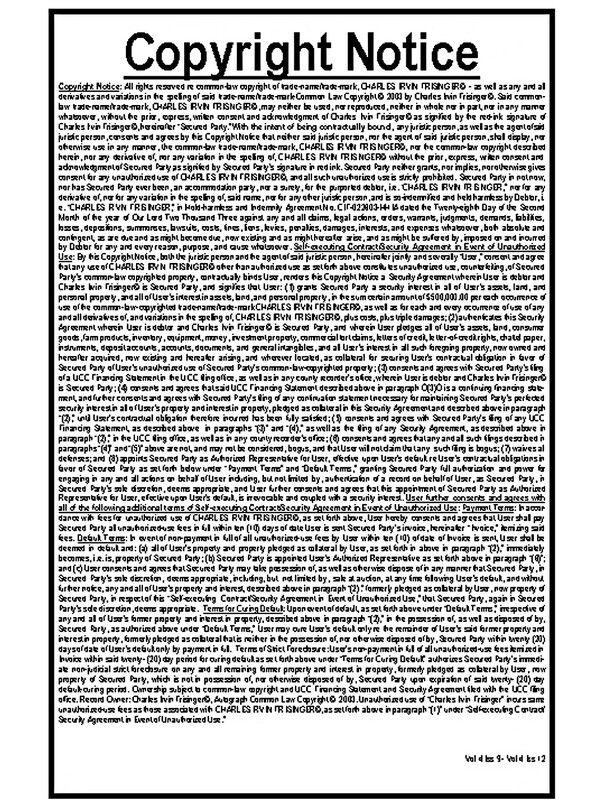 If you need help we can give you a reference .Once you have your name copyright we will run it in the newspaper for four consecutive weeks, just like the Land Patent. You will also receive the affidavits and the four corresponding newspapers. Federal "No Trespassing" signs: These are $3.00 each. For any additional information, Please contact us directly.